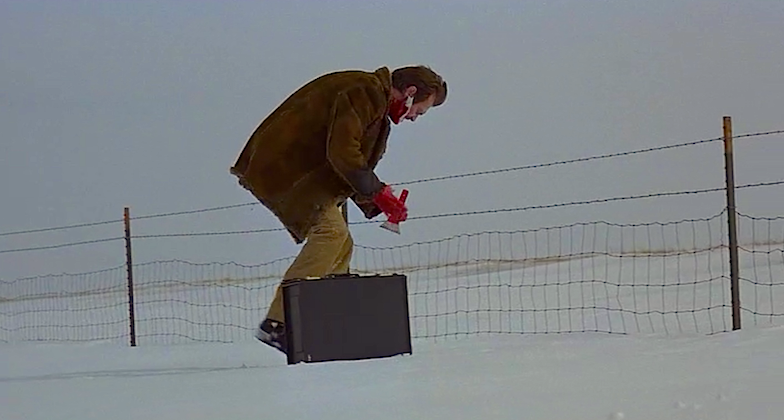 I can vividly recall my pangs of guilt as I laughed throughout The Coen Brothers’ Fargo in 1996. I felt guilty for laughing at something that was stated to be a “true story” and that was the point. It is not always a negative when film causes discomfort or leaves the viewer troubled after seeing it. The challenge for me is that I needed a bit of distance and then a “revisit” to this movie to articulate my opinion. The Zellner Brothers have created a film that is a bit closer to “truth” than The Coen Brothers’ “Fargo” back in 1996. The Coen Bros’ cleverly elevated the cultural satire of “Fargo” to lead us to believe it had all been based on fact. There was no real Internet for us to access to determine if there was any “reality” in the story of “Fargo” at that time. We now know that there was actually nothing “true” about “Fargo” except the disquieting “truth” that it most certainly could have happened. In The Zellner Brothers’ film it is never explained why or how Kumiko manages to “unearth” a battered VHS tape of “Fargo” — and this is a wise choice. 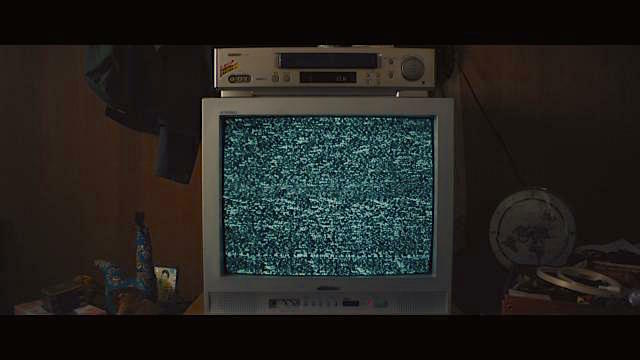 The VHS tape is damaged, but Kumiko can see Steve Buscemi bury the ransom loot in Fargo. David and Nathan Zellner’s film is an abstractly loose variation on an actual incident involving a Japanese woman who died in the unforgiving climate of Fargo’s winter. The real “truth” was she was there to revisit memories of a past love. But due to misunderstandings in the communications of her English prior to her death, false rumors began to form into a “truth” that she had traveled to Fargo to find what she “believed” to be the stolen money buried in The Coen Brothers’ 1996 film. Rinko Kikuchi’s Kumiko is so lonely, isolated and detached from her reality that she mistakes an American Film for “truth” — and finds a new reason for her existence. Kumiko The Treasure Hunter, David Zellner, 2014. “Kumiko Treasure Hunter” plays with the the idea that has remained firmly grounded in the realms of urban myths generated by “Fargo” the movie. 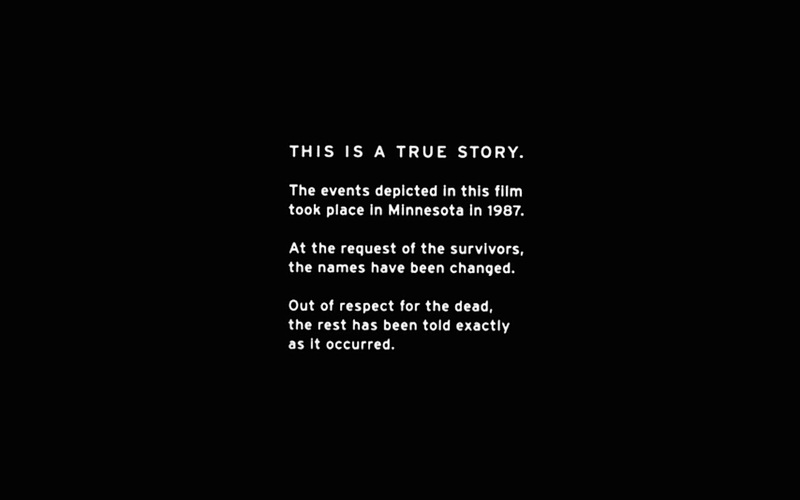 It is clear Kumiko mistakes that iconic film’s opening statement, “This is a true story” for “fact” and assumes she is seeing some sort of documentary. Steve Buscemi as the little kinda funny-lookin’ guy. 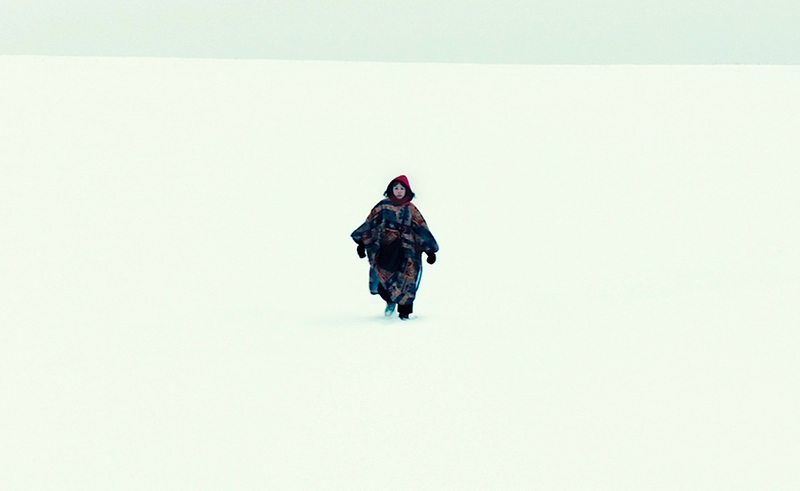 As the VHS tape of Fargo comes to an end, Kumiko can only stare at the static contemplating what she has just seen. Kumiko’s discovered VHS tape may have ended, but an almost pathological obsession is only beginning to form. Rinko Kikuchi gives a painfully realistic performance of a woman so depressed and detached from her own world in Tokyo — her only “friend” is her pet rabbit. She seems unable or unwilling to “connect” with anyone other than her pet. This simple plot point regarding Bunzo, the cute little bunny, is actually startlingly important. Bunzo is the only aspect of her life that matters to her. She cares for him better than she seems to care for herself. But her inability to apply logic to align the reality of her situation with an illogical desire, pushes her into the realm of self-decption. So intense is the desire to pursue that ransom loot buried in Fargo she slips into an obsession. An obsession that out values anything “real” in her life. For Kumiko is really no big deal to steal a company credit card and abandon everything in her life to pursue this newly formed purpose. But leaving Bunzo is devastating for her. A girl and her rabbit. As she attempts to set her sweet living love free into the nature of a park, she realizes the domesticated innocence is unable to connect to nature. Like Kumiko, he is a misfit. Kikuchi’s performance matched with the impossibly cut rabbit elevate to tragedy as she leaves Bunzo on the seat of a subway. Bunzo must depend upon the kindness of strangers on the Tokyo subway system. As difficult as it may be, Kumiko has no choice but to pursue what she perceives as her personal destiny to to find her way to Minnesota in pursuit of what she now perceives to be her life’s mission. She is hellbent on finding that case of money she saw Steve Buscemi buries in the snow. David Zellner’s film is even more quirky than Coen’s “Fargo.” But this quirkiness is established in the ways we see a clearly unstable woman interacting with her Japanese peers, boss, family and the local Americans as she refuses to relent in her pursuit. It is a fascinating journey to follow. Two equally eccentric but well intentioned men attempt to help Kumiko find her way to Fargo as well as toward salvation in Jesus. Mixing realistically comic encounters with the increasing uneasy tone is achieved by a balance of acting fused with effective musical score / camera work. The movie is constantly challenging the viewer to know if it is “ok” to chuckle/laugh or if this reaction is inappropriate. This required self-introspection of the audience is not only challenging — it requires viewers to evaluate individual connections to humanity and his/her own perceptions of reality. Kumiko is getting close to her purpose as she gazes up to an American Parable in of itself. Rinko Kikuchi never drifts away from what is clearly a tragically lost character in dire need of help. This entire cinematic experience is both fascinating and devastating in equal measures. Kumiko The Treasure Hunter is one for whom we cheer. And she is also a tragic parable of humanity pursuing dreams that are impossible to achieve. This masterful film weaves its way into our minds and hearts. One should not miss the opportunity to see this movie. It carries a disarming level of power. 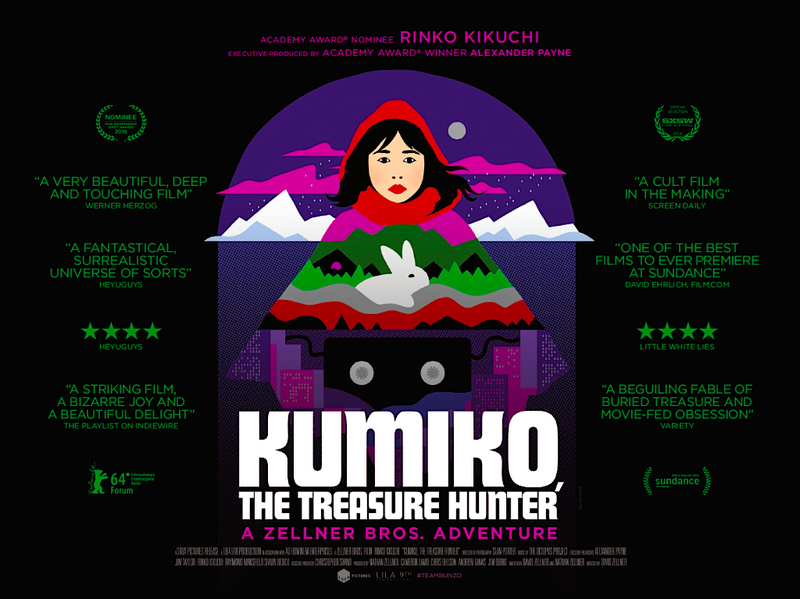 Rinko Kikuchi is Kumiko The Treasure Hunter.